Plain tomato sauce can be boring but amp it up with same veggies and it really is an improvement. 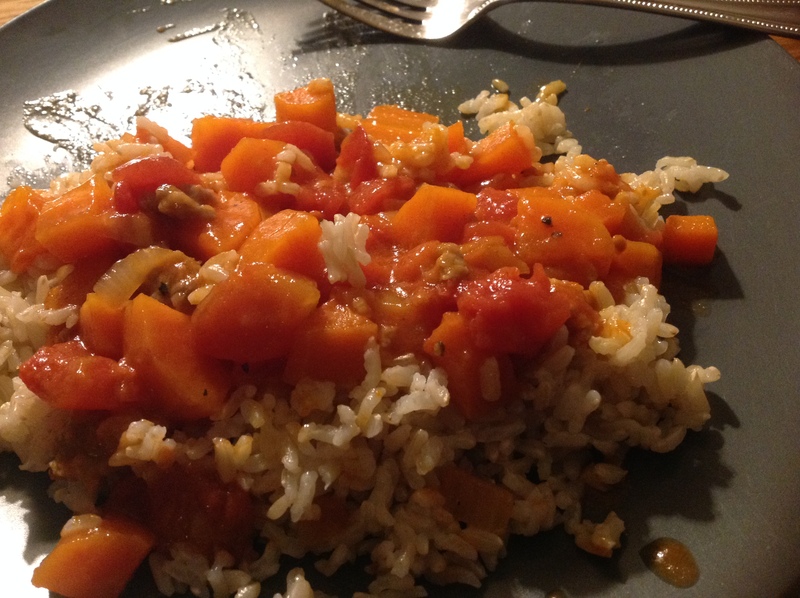 This sauce started out with sauteed onions, then some diced carrots added, cooked till soft. A link of sausage, casing removed, added and cooked, finally, a can (14 oz) of diced tomatoes and half a can (or less) of tomato soup (Cambell’s), undiluted. Simmer and season. Basically a broccoli pie but instead of a typical yeast dough, just flour , (with a bit of bacon fat rubbed in), and water with pinch of salt. similar to a pie crust. I started with about a cup of flour. 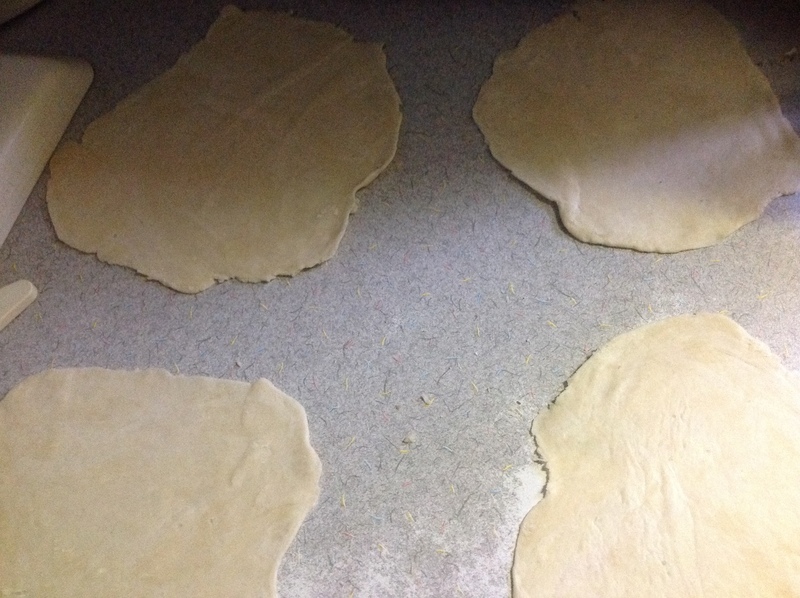 roll out the dough into separate circles. 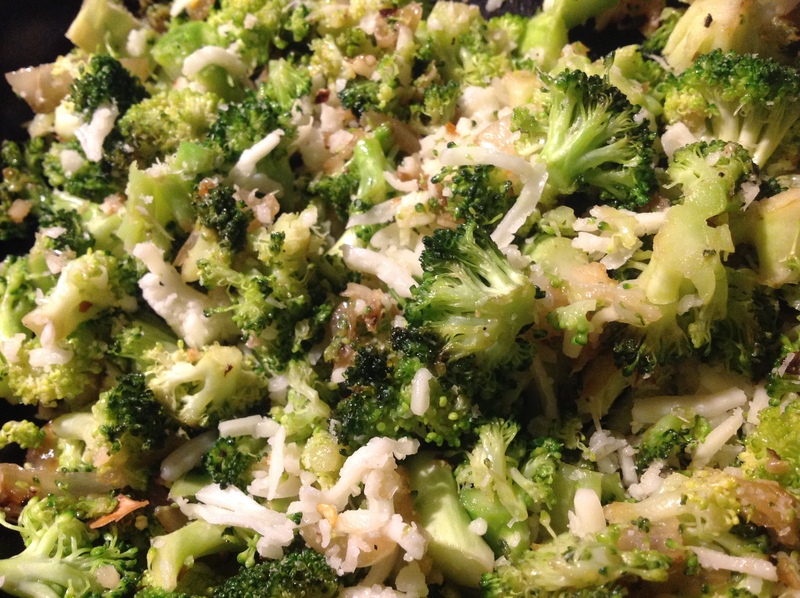 Make a mixture of broccoli, (diced) onion, garlic, etc. (stir fry quick),cool, then add some shredded mozzarella too ! Sausage would also be a excellent addition. 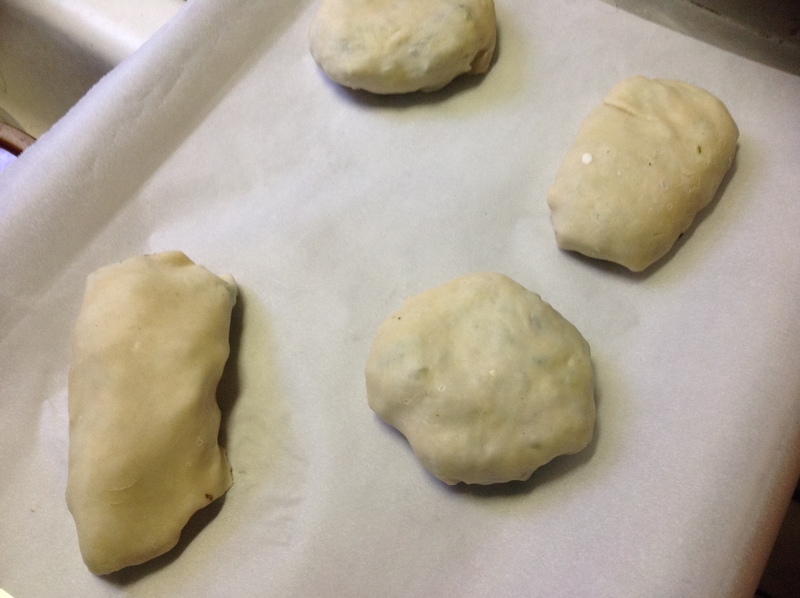 Carefully, fold over the dough to meet edges, tuck and form into balls, then flatten slightly on lined sheet pan. 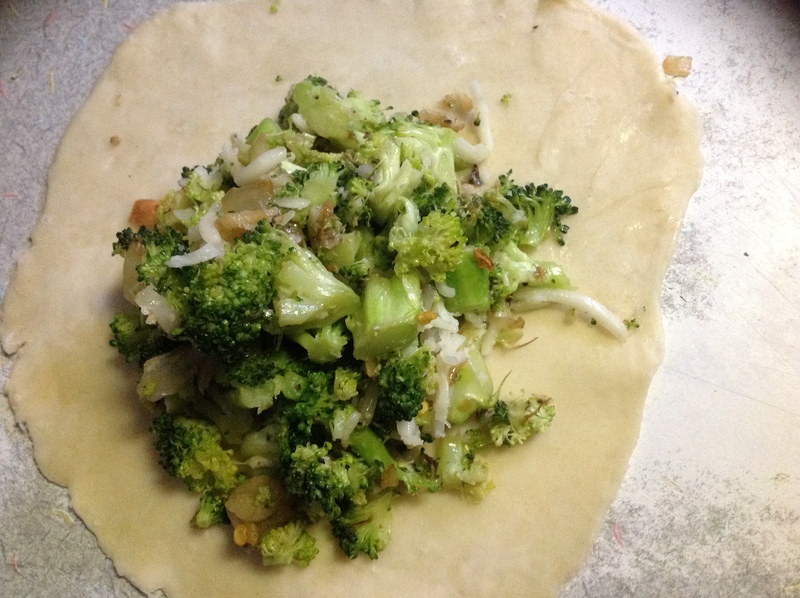 similar to a broccoli pie, but thinner dough and more of a crunch. Prepared for the freezer, some ground for hamburgers, some sliced for stir fry etc. and some cubed for a stew type recipe. 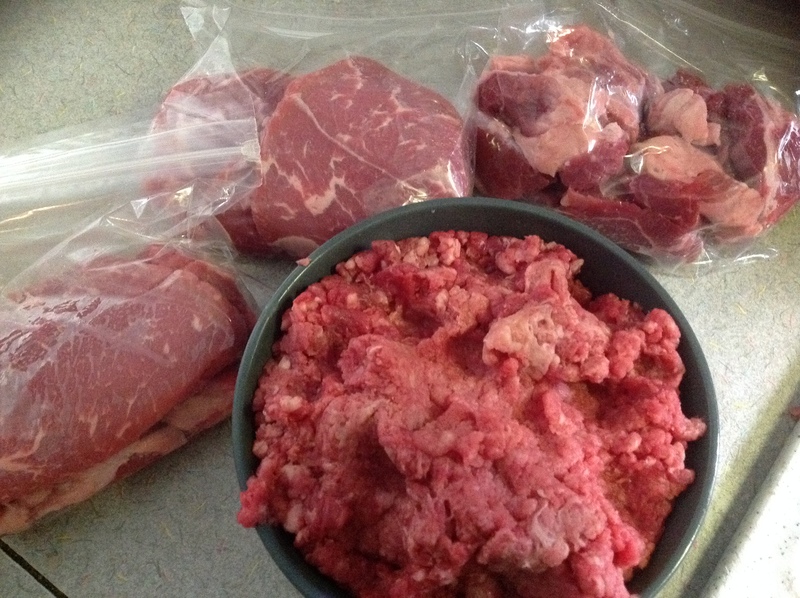 I find it easier to grind and cut the beef than to buy separate, ground beef and stew meat portions. 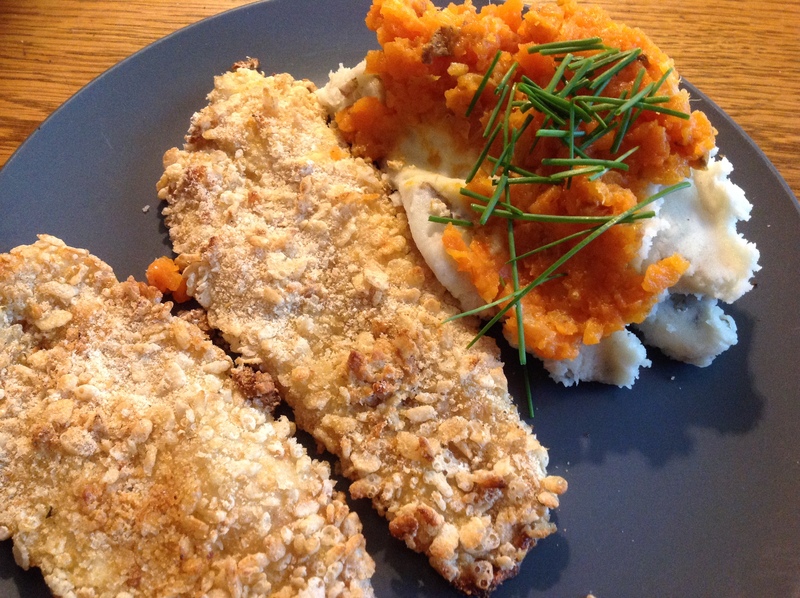 Diane prepared the fish fillets with seasoned breadcrumb and rice crispy (cereal) coating that was baked in the oven till crispy. 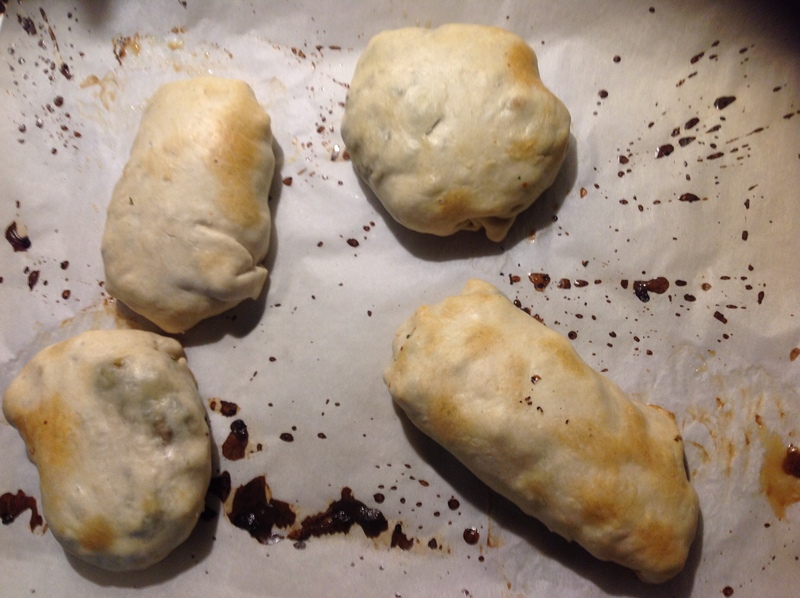 Several potatoes washed and scrubbed, microwaved, wrapped in foil , and later whipped in the mixer with milk. Carrots, simmered in chicken broth, and then whisked in the mixer also served. Topped with fresh cut chives. The weather , very cool this morning and an effort to get out of bed early was successful. Did some gardening work weeding around the tomato pepper and eggplants. Some spent grain that was stored from previous beer brewing was used as mulch. Next is to repot or plant some pepper plants . Some of the herbs growing this year . Bacon greased was used sparingly , first to sauté the garlic and oregano with some butter. A bit of flour was added, not to make a thick sauce just to give it some flavor and body, cooked till the floury taste subsides. After the chicken breast are finished , the sauce was strained , and poured over the plated chicken. Garlic crisps can be used as garnish. Sliced potatoes quickly cooked in the fry pan and served with chopped chives served as a side.